President Donald Trump, accompanied by South Korean President Moon Jae-in, speaks in the Rose Garden of the White House in Washington, June 30, 2017. 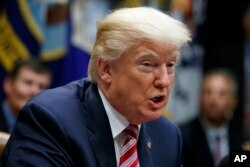 President Donald Trump is heading to Asia for a 12-day, five-nation tour with heightened tensions on the Korean Peninsula and recent polls showing Americans consider North Korea to be the most immediate threat to the United States. Trump is scheduled to visit South Korea (Nov. 7-8), the North's rival, for the second stop of the trip. During the trip, talks with South Korean President Moon Jae-in and other world leaders are expected to center on questions about how to deal with Pyongyang’s ongoing development of nuclear weapons and ballistic missiles. “Our goal is not war, but rather the complete, verifiable and irreversible denuclearization of the Korean peninsula,” said Defense Secretary Jim Mattis at the Demilitarized Zone (DMZ) between North and South Korea, last Friday. 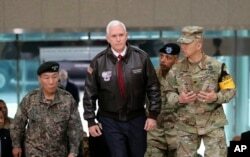 U.S. Vice President Mike Pence arrives at the border village of Panmunjom in the Demilitarized Zone which has separated the two Koreas since the Korean War, South Korea, April 17, 2017. The U.S. president will not go to the DMZ and peer into North Korea, eschewing a highly symbolic photo opportunity made by about half of his predecessors since the Korean War. It will be the U.S. Navy, instead, that is likely to provide the timely backdrop representing America’s commitment to protect South Korea. Around the time of the president's presence on the peninsula, three U.S. aircraft carriers are expected to engage in their first combined exercise in a decade, displaying to Pyongyang the deterrence power of the world's largest Navy. There is increasing anxiety on both sides of the Pacific about what Trump views as necessary to achieve his administration’s vow to eliminate the threat to the United States posed by Pyongyang’s weapons of mass destruction. “I think we will come down to a point where — I liken it to a kind of a Cuban Missile Crisis — there’s a finite time period where we have to make a decision, whether it’s political or military, that really will change the political landscape of the Korean peninsula,” says Jae Ku, director of the U.S.-Korea Institute at the Johns Hopkins University’s School of Advanced International Studies. President Donald Trump speaks during a meeting at the White House, Oct. 31, 2017. The U.S. president and North Korean leader Kim Jong Un recently have had an unprecedented, highly charged exchange of rhetoric. Some in South Korea, including the main opposition conservative party, are pushing not only to have American tactical nuclear weapons brought back to the country — but also for U.S. support to allow Seoul to possess its own nuclear arsenal. “If the two countries push forward with redeploying tactical nuclear weapons, I’m certain it’ll not only show the people of the two countries the solidarity of the alliance, but also prevent Kim Jong Un from having further desires to provoke,” Liberty Korea Party Chairman Hong Joon Pyo said (Oct. 26) at the National Press Club in Washington. Polls show 60 percent of South Koreans favor building nuclear weapons and nearly 70 percent want the reintroduction of American tactical nuclear weapons for battlefield use, which were withdrawn in 1991. “You sense the anxiety, you sense the fear, you sense that this is something different that the Koreans are facing. And so, as a result, I think they have latched on to this idea that tactical nuclear weapons may provide that kind of security to them and they haven’t thought through all the messy issues that come with it,” Ku, the U.S.-Korea Institute director, told VOA. South Korean President Moon Jae-in speaks during a press conference marking his first 100 days in office at the presidential house in Seoul, Aug. 17, 2017. President Moon is ruling this out. “According to the joint agreement by the two Koreas on denuclearization, North Korea’s nuclear state cannot be accepted or tolerated. 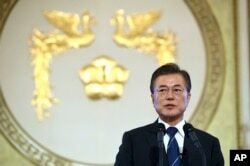 We will not develop or possess nuclear weapons either,” Moon told the National Assembly in his state of the nation address Wednesday. Trump will address the National Assembly before flying from South Korea to Beijing. There, he will discuss the heightened tensions on the Korean peninsula with Chinese President Xi Jinping. China is North Korea’s only remaining significant ally. China has expressed frustration with its smaller but increasingly provocative neighbor, but Trump is expected to request that Beijing apply even more pressure on Kim Jong Un.